API Integration Guide - Report Bad Buyers and Screen New Buyers! How to integrate the API? 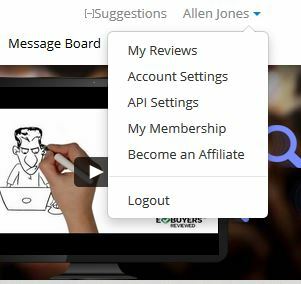 STEP 1 Log in eBuyersReviewed and click on the API settings section (Figure 1). STEP 2 Click on the Re-generate API Key button in case you need another API key. The API key is required for authentication (Figure 2). We recommend testing the API by using the code from the “Test API key” row. The test mode allows unlimited test reviewing and screening, without using your screening credits. To switch from test to live mode, you need to use the iframe code from the “Production API key” row. This will enable the real time reviewing and screening features of the tool. "error":"This email address is not registered in our system!" "1" - screening is disabled. formatted_address string The address entered upon screening can be changed and standardized. It will show an empty field if it cannot be standardized. results object array List of all unique reviews. The description is in the next table. average_risk_level_text string Buyer's average risk level: "neutral", "low", "low-to-medium", "medium", "medium-to-high", "high"
Here are two examples of how you can test the API using jQuery or PHP. To use either one or both integration methods, you need to have registered with eBuyersReviewed.com. Click here to sign up.